What’s your threat? There are plenty. Tornadoes, earthquakes, wildfire, terrorist attacks, and more. But what I find most frightening is the thought that I might be missing a family member or two when it happens. It doesn’t matter what disaster you experience, unless every member of your family is at home all the time, there is a pretty good chance you’ll be separated at some point either during or after the disaster. One or both of the parents could be at work, children at school or friends’ homes or other extra curricular activities. Or you could get separated in the confusion of the aftermath. Think about your family life and how many minutes of the day everyone is actually in the same place at the same time. If your family is anything like ours, it’s just not very often. I am a mom and my family means the world to me. I don’t want to ever have them separated from me, especially in an emergency situation. But how can we make sure we have them all together? Use these seven tips to give you a better chance of keeping your family together in an emergency. 1. Have a plan. Decide what your plan is and how you will make it happen. Write the plan down so nobody is confused (I’m sure you all don’t have communication disconnects between family members like we do, but just take my word for it and write it down). A written plan clears up all the details for everyone involved and helps you remember what you decided on. Keep a copy at the house and in the family vehicles for reference. Make sure every family member, including any children, knows the plan. Once you have a plan in place, give it a practice run to see how it goes. 2. Have more than one method of communication. Cell phones work great on a normal day, but in an emergency the towers can become overloaded and your calls will not go through. Because texting works on a slightly different part of the airwaves and use very little of it, texts might get through when phone calls cannot. Two way radios work well, and anyone can use them. They have a limited range, usually restricted by line of sight, so if you are far from home they will likely not be your best option. Amateur or ham radio can carry signals farther than most other methods and is extremely reliable. Range can be limited if repeaters (specific radio towers) are damaged during the disaster, and each family member that will be using the radio needs to be licensed. 3. Have a code word for emergency. Remember Alas, Babylon? A code word or phrase can communicate a lot of information with just a word or two and set your family’s emergency plan into action. You could have a code word to text to older school age children that means they are to check themselves out of school immediately using a pre-written note signed by their parents and return home. Or a code word that notifies everyone to get to a predetermined safe area. 4. Get to know the emergency plans of any schools or care centers your children attend. Do they have a plan in place or any restrictions on parents picking children up during or after an emergency? You could also consider homeschooling or having your children attend an online public or charter school so they spend less time away from home. 5. Keep updated family photos in each family member’s emergency kit. This does not need to be a professional photo. In fact, what you look like everyday will be perfect since that’s probably what you’ll look like in an emergency. It is much easier to ask if someone has seen your child if you have a photo of them rather than trying to describe them. Same for kids looking for their parents. 6. Establish at least two meeting places. One within walking distance of your home, and one within half a tank of gas. In the event your home is damaged but others are not, where in town could be your backup meeting place? Maybe a trusted neighbor or friend’s house. Maybe a church or public building. But what if your entire town is evacuated or deemed unsafe, where will your family meet? Choosing a place within half a tank of gas driving distance (up to 250 or 300 miles from your home depending on your vehicle) will get you out of harm’s way and make it so you do not need to stop for gas to get there. You are filling your gas tank before it gets below half full, aren’t you? If you haven’t been, this is a good reason to start! You may need to have a back up plan in another direction, depending on the emergency. 7. Make a long term separation meeting plan. What if it is the end of the world as we know it? What if the affected area is very large and communications and travel are down for an extended time? And what if a family member was very far from home when it happened? For your long term separation meeting plan, pick a specific day or two of the year that your family can all remember and a place that you will meet on those days. Like this: On mom’s birthday and Halloween we will meet at the park at the center of town. And then everyone who can meet there will be reunited. Keeping my family together is one of my top priorities in any emergency. While there are no guarantees, following these seven tips can greatly increase the chance that your family can stay together or be reunited following a disaster. 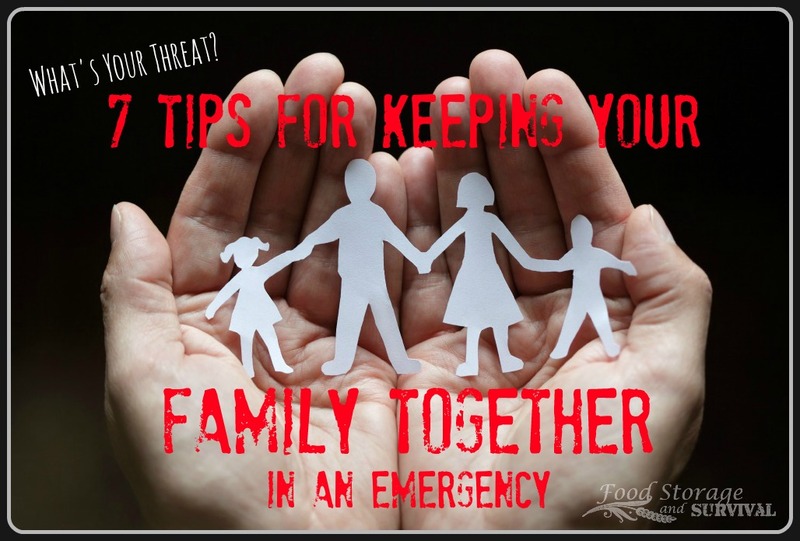 For all you audio learners, listen to my podcast about these 7 tips to keep your family together in an emergency here! This post is part of the “What’s Your Threat?” blog hop. What’s the biggest threat to you and your family? 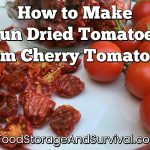 Check out these amazing blogs and how they attack their biggest threats to being more prepared and more self-reliant!